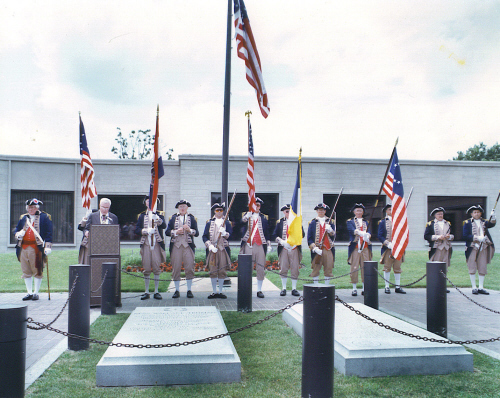 The MOSSAR and KSSSAR Color Guard participated in a patriotic parade and ceremony in honor of President Harry S. Truman, at the Harry S. Truman Presidential Library in Independence, MO on Monday, July 4, 1994. 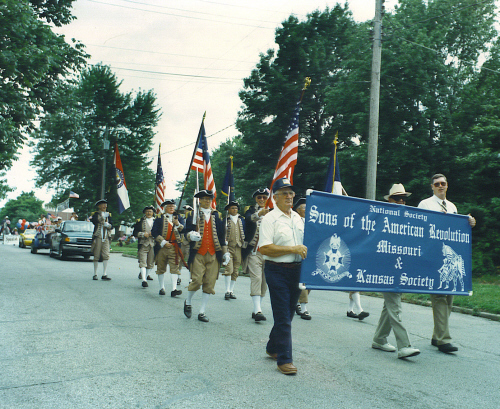 Left Photo: The MOSSAR and KSSSAR Color Guard participated in a patriotic parade in Independence, Missouri. 1st Row (L - R): - Phillip K. Kelley, James L. Gillham, Robert C. Turner (All Missouri compatriots). 2nd Row (L - R): - Robert L. Grover, Craig Uncapher, Sterling E. Goddard (All Missouri compatriots). 3rd Row (L - R): Harley C. Davis, (Missouri compatriot), ? (Kansas compatriot). 4th Row (L - R): Robert S. Slemmons (Kansas compatriot). 5th Row (L - R): Kes H. Kesler. (Kansas compatriot). Right Photo: The MOSSAR and KSSSAR Color Guard participated in a ceremony to honor President Harry S. Truman in Independence, Missouri.